The Boston University women’s lacrosse team celebrated Senior Day Saturday afternoon with an important 9-6 win over Bucknell University at Nickerson Field. With this win, the Terriers (7-6, 3-3 Patriot League) now improve to a four-game winning streak and maintain their sixth place ranking in the Patriot League, which Bucknell (3-10, 1-5 Patriot League) threatened to knock down a peg. Senior attack Avery Donahoe, who has led BU in goals for much of the 2018 season, did not play in the matchup due to an injury sustained in the Terriers’ 16-13 win over the University of New Hampshire Wednesday night. The exact nature of Donahoe’s injury still remains unknown. Sophomore midfielder Lexi Lewis put the Terriers on the board early when she wove through Bucknell traffic to swat the ball into the back of the net. Following a Bison goal from sophomore attack Lillie Hunt, BU got on the board again when sophomore attack Kailey Conry fired a high shot to the top left corner, continuing her streak of being the only Terrier to score at least once in every single game this year. BU freshmen midfielder Ryann Gaffney and attack Ava Barry quickly followed up with two goals of their own to give the Terriers the three-goal lead with just over 20 minutes left in the first half. Despite the strong start, BU’s offensive game — with its best scorer off the field — was noticeably less aggressive. Following Barry’s goal, it would take almost 15 minutes for the Terriers to find the back of the net again. After the Bison tallied two more goals, Gaffney broke BU’s dry spell with her second of the day. Freshman attack Makenzie Irvine finished up the half with a blistering shot that met the twine with just four seconds left in the frame, giving the Terriers a 6-3 lead. At the beginning of the second half, BU’s offense continued to show some cracks — struggling to maintain control of the ball, which culminated in a goal from Bison junior attack Audrey Walsh right at the Terriers’ doorstep. Regardless of some shortcomings on offense, BU’s defense held strong, due in part to the performance of senior goalkeeper Christine Laible. Laible saw some of her best goalkeeping of the season, with a goal save percentage of .625 for the contest, compared to her season average of .443, and 10 saves on the day. However, the Bison put another point on the board after Laible deflected a free-position shot that bounced off the shin of Guerra and into the net. The fluke goal helped to reinvigorate the Terriers’ offense, as it was immediately followed with an offensive blitz from BU. Rushing down into the Bucknell zone, Conry passed the ball across the middle to senior midfielder Caroline English, who fired one high from the side to meet the top left corner of the cage. Barry followed that goal up 46 seconds later with one of her own, working her way from behind the net to fire one in. Not much later, Conry earned her second goal of the game, firing low while meeting some Bison resistance to bounce one into the cage. With the score now 9-5, the Terriers kept their momentum on offense and held firm possession of the ball. Bucknell eventually saw the scoreboard again when freshman attack Eve Calabria bounced the ball past Laible with a minute and 44 seconds remaining, but the outcome of the game had already been sealed, and BU won the contest 9-6. Although Donahoe’s absence didn’t hold back the Terriers from obtaining another victory, for a team that has finished games with goals in the high double digits, their missing player was still evident. 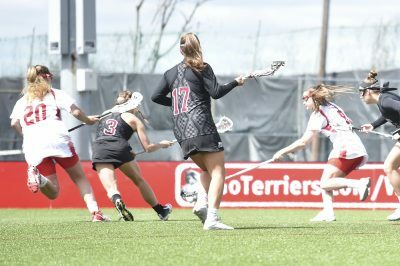 “We were a little slow offensively, and we need to get faster for the week coming up,” Robertshaw said in light of her team’s next matchup against the College of the Holy Cross.